A Shout Out to St. Michael's Catholic School of Livonia, Michigan! Near the end of the 2013-2014 school year I received several letters and cards of encouragement from the sixth grade classes of St. Michael's Catholic School in Livonia, MI. Several of our Sisters live in that area and a few of them still minister at the school. 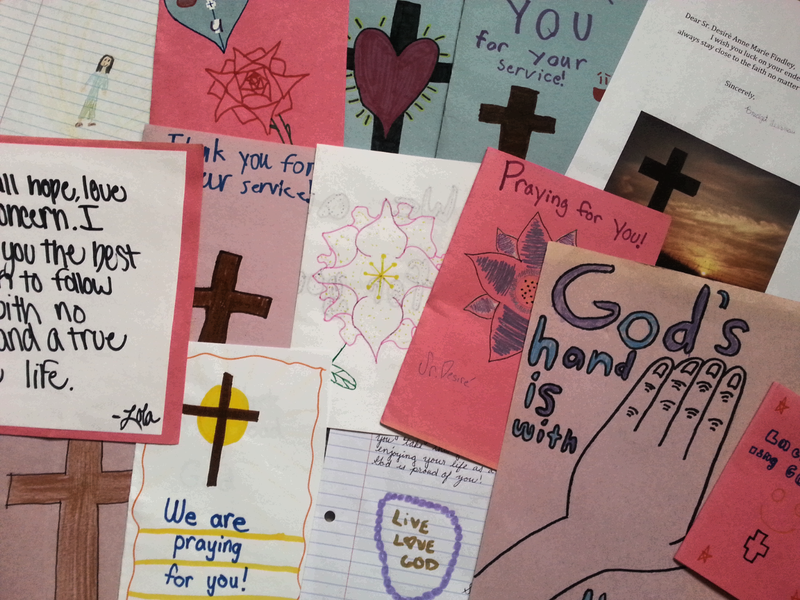 For Catholic Schools Week the students were asked to pray for a specific individual and then send him or her a card. I was blessed to be one of those recipients, and so I still have in my possession their very thoughtful, colorful, inspirational and prayerful messages. So a very big THANK YOU to them! At first, was it hard to understand God's call when it happened, or did you understand it right away? It started out kind of slowly, like an idea that popped into my head when I was around your age. It seemed like something that would be really interesting and unique and I thought to myself, "I think I'd like to join the convent." I thought about it again in high school and then again in college. It just always appealed to me. Eventually I met some Sisters at a convent near my house and I started spending time with them. Soon I decided to join, and I've been happy ever since. For me, God's call was very subtle, but very simple, so I understood very easily what God was asking of me. Do you have to stay inside all the time? I do not have to stay inside all the time, but there are some communities of religious who do. They are called "cloistered" and their main ministry is prayer. Our community is active-contemplative, so we pray a lot, but we also get out and do a lot. If you're wondering what sorts of things we do, we help the homeless, some of us teach, we go shopping for things we need, we go to the beach, we go to the State Fair, we go out to eat, we go out to get exercise, we give retreats, we visit with people in hospitals, we do lots of stuff! I love to read. Some of my favorite books are "The Chronicles of Narnia", "The Hunger Games", and pretty much any book with stories about miracles and Mary. I like to read books that help me learn more about my faith and that show me how God works in other people's lives. How old were you when you decided that you wanted to devote your life to God? How do people in formation earn money to feed themselves and the poor? Do you earn the items you need by getting a part-time job, or do you rely on donations? I was 22 years old when I decided to devote my life to God. I had just graduated from college and I wanted to be and do something that would give my life purpose. I was not living for God before college, so I wanted to change that. I felt a strong desire to dedicate myself to God by surrounding myself with others who wanted to do the same. That's when I met the Felician Sisters! They were women who had dedicated their lives to God and I admired them very much, so I decided to dedicate my life to God with them. People in formation receive an allowance once a month. Since they don't have paying ministries (jobs), Sisters in formation receive money from the Sisters who do get paid. Basically we have one main bank account, like a big pot where everyone's money goes. Then, from the big pot everyone gets money according to what they need. If I need a lot of things because I have to buy clothing and food for the poor, then I might get more money than someone who only needs to buy school supplies. Our vow of poverty reminds us that we must be willing to share what we have, including money. Now that I teach, I’m happy that the money I make can be shared with Sisters around the world for whatever they need. Sometimes we do receive donations, and that is very helpful. When people donate their money, it helps us provide for people in our jobs, on the streets, and in other countries. How did you know you wanted to become a Sister? Did God ask you? If he did, how did he ask you, or how did you realize he was calling you? Why did you want to become a Sister? I knew I wanted to become a Sister because I knew I wanted a deeper relationship with God and I felt that this was the best way for me to do that. I think that whatever vocation God calls us to is the one that He knows will deepen our relationship with Him. For some of us, getting married helps to deepen our relationship with God. For others, like me, a vocation to the religious life is what helps. As soon as I made the decision to become a Sister, I was at peace. Even when I miss my family or have a tough day, this peace never leaves me. I never really heard a voice of God asking me, but it was more like a longing in my heart. I wanted something very special, and this seemed to be the answer. So instead of a voice, it was more like I felt God’s love drawing me here. I realized this because of the peace I mentioned. My heart was asking for something I had not yet given it, and so when I decided to dedicate myself to God, it was like my heart finally felt at home. I knew this was the place for me because any obstacles that might have kept me from becoming a Sister were cleared out of my way. For example, someone who wants to join the religious life cannot be in debt. We cannot owe money from loans or large purchases like cars, and when I decided to join the convent I still owed $3,000 to college. I did not have enough money to pay off that debt so I said to God, "If this is really where You want me, You'll have to figure something out because I can't take care of this." About a month later I received money from my school and was able to pay everything off! I didn't have any more debt. It was like a big, "Yes, this is what I want you to do," from God, so it was very clear that I should move forward with my decision to become a Felician Sister. How long did it take you, or how long has it been, since you decided to become a nun? when I decided to join the convent (fresh out of college!) and it will take me about four more years before my commitment is permanent. Right now I am in a stage called “temporary vows”. This is a time where we take our vows, but they sort of expire after one year. When they expire, we renew them and continue our commitment for another year. After about six years in temporary vows, we make “final vows” and that’s when our commitment is permanent. If at any time during temporary vows I thought God was no longer calling me here, then after my vows expired I would choose not to renew them and then I would return home. 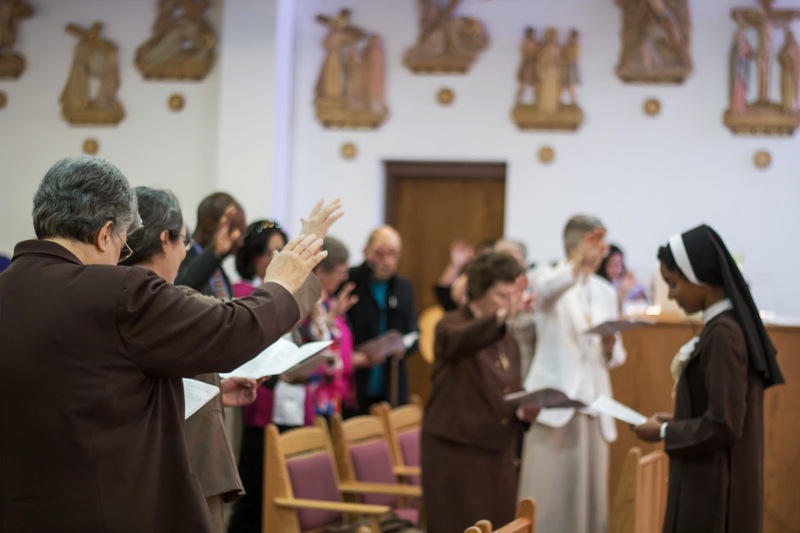 But before we even take vows for the first time, we spend three years learning about the community and getting to know what it’s like to live as a Sister. So it takes a while, but that’s to help each person make sure this is really the life for them. When did you get your calling to be a Sister? Are there any other people in your family that are involved in religious vocations? Are you interested in community service, such as teaching or working with the poor? Or would you rather do things within the convent? I believe the first time I really felt called to religious life was around your age. I remember already thinking in middle school (or junior high) that I would probably like to join the convent. When I was 22 I felt like it just needed to happen, so after getting to know the Felician Sisters I asked to join their community and here I am five years later! No one else from my family is in religious life yet. I had an uncle who was studying to be a priest when he was a young adult, but he got sick and was never able to fully recover. Other than that, I’m the one and only so far, but perhaps one day that will change. My youngest sister is 9 and she already thinks that maybe this is the life God is calling her to. I really enjoy being with people, so I am very happy to be teaching. This is only my second year as a teacher, but I already love it. I teach at an all-girls Catholic high school here in California. It’s such a blessing to minister to young people through education, but one day I do hope to work with the very poor here in our country and in countries like Africa or Haiti. We have convents all around the world, so it is definitely a possibility! Again, great questions all of you, and thank you everyone for the letters! I loved reading every single one of them and I will definitely keep all of you and your school in my prayers. If I had any advice to give you about finding your own vocation, it’s this: Be confident of God’s love for you. He knows what you need and what you desire, so pay attention to those things and He’ll lead you on the greatest adventure of your life!